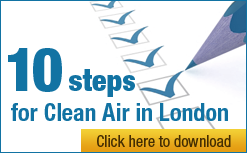 I am writing on behalf of Clean Air in London (CAL) with comments on this consultation, which closes on the 8 February. Please note that this response is focused on proposed changes to the Greener Vehicle Discount (GVD). CAL currently has no views on other proposed changes to the Congestion Charging Scheme. CAL understands that the primary aim of the Congestion Charge is to reduce congestion, and its associated negative impacts, inside the charging area. An important secondary objective is to reduce the environmental impacts of road vehicles in central London. Road vehicles emit both carbon dioxide (CO2) and air pollutants (such as oxides of nitrogen (NOx) and particulate matter) from their exhaust pipes. Emissions of CO2 from vehicles in the charging area are relatively insignificant on UK and Greater London scales, however emissions of air pollutants from the same vehicles are of critical importance for air quality in central London. The prime environmental impact of road vehicles in the charging area is therefore air quality, with CO2 emissions being an important, but secondary, consideration. You will be aware that the WHO has classified diesel exhaust as carcinogenic for humans. The original, technology based, Congestion Charge discounts were successful in accelerating the uptake of new, low emission vehicle technologies such as petrol/electric hybrids. The GVD introduced in January 2011 has been much less successful in this respect. As the consultation document points out, ‘since … January 2011, the number of qualifying car models has tripled and many of these cars no longer have the lowest emissions on the market’. The majority of qualifying vehicles are relatively small, cheap diesel cars i.e. vehicles that do not need incentives to encourage their uptake. CAL believes that the suggested 75 g/km CO2 limit for the new GVD will suffer similar problems, namely that small, cheap diesel vehicles that meet this criteria will soon flood the market. At the time of writing diesel cars emitting 84 g/km were widely available (e.g. Hyundai i20, 1.1 CRDi Blue). Figures from the Society of Motor Manufactures and Traders showed average emissions from the ‘mini’ car segment fell by 5.6% during 2011 (the latest year for which figures are available), continuing the trend of declining CO2 emissions from all sectors of the vehicle market. The ability of the motor industry to quickly drive down CO2 emissions from conventional diesel vehicles should not be underestimated. The current GVD also includes air quality criteria: qualifying vehicles need to meet the Euro 5 standard for pollutant emissions. Euro 5 sets separate standards for diesel and petrol vehicles, with diesel vehicles ‘allowed’ to emit considerably more air pollution than equivalent petrol vehicles. Evidence also now suggests that Euro 5 diesel vehicles emit considerably more NOx in urban driving conditions than previously thought, and also that more of this NOx is emitted as ‘primary’ nitrogen dioxide (NO2). Providing small Euro 5 diesel vehicles with free access to the congestion charging area has therefore been a huge backwards step for air quality. It is essential that the new GVD criteria do not simply replicate the failures of the previous system. They must prioritise air quality by setting an effective air quality standard and a stretching upper limit for CO2 emissions. Emerging low and zero emissions vehicle technologies (such as electric and natural gas vehicles) will struggle to gain market share if conventional, cheaper diesel vehicles enjoy exactly the same tax and charges advantages. This need for support is underlined by the slow sales of battery electric vehicles in the UK – in 2012 only 1,262 were sold. The Euro 6 standard for cars and light vans will come into force on the 1 September 2014 for new types of vehicles, and from 1 January 2015 for the sale of all vehicles. Many manufactures are now ‘pre-complying’ with new model releases to avoid having to make modifications to vehicles part way through model cycles. Due to the high NOx emission from Euro 5 diesel vehicles, the proposed continuation period for vehicles that meet the current Greener Vehicle Discount criteria is also too long. These vehicles should have to pay the Congestion Charge from no later than 31 March 2014, instead of the proposed date of 29 June 2015.